This translated poem in ASL by the artist is based on Meng Hao-jan's poem (originally in Chinese). Below is the approximate translation in English (by unknown). 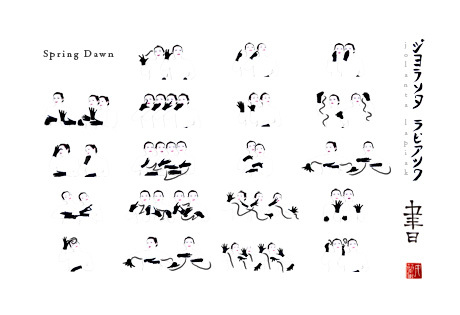 The work Spring Dawn (2010) was inspired by Meng Hao-jan's poem. The literary media artist Jolanta Lapiak translated the English version of Meng Hao-jan's Chinese poem into ASL and into one-of-a-kind, innovative, never-seen-before mediums, both in print and video. A translation in the process may lose or gain some interesting poetic features from the original Chinese poem into English and then into ASL. In translation, Jolanta created some interesting symmetry rhymes and other poetic devices arise in ASL. Print on fine art paper or glossy photo paper with archival pigment ink is available.